Derek Warfield and The Young Wolfe Tones are known throughout the world for their quality musical presentation of Irish patriotic songs and traditional music and their Mayo fans will be delighted to know that they will be performing in Achill Island in Gielty’s Clew Bay Bar, Dooagh on Friday evening, August 10. Derek Warfield is best known as one of the founding members of the legendary Wolfe Tones band who performed for close to 40 years. He has written over over 60 songs and ballads and has enjoyed releasing best-selling albums, number one hits, television appearances and shows in Carnegie Hall, New York and the Royal Albert Hall, London. Ten years on from the beginning of his solo career, the man often described as ‘Ireland’s greatest ballad singer’ is bringing an old tradition with a young sound to his legion of fans across the world. 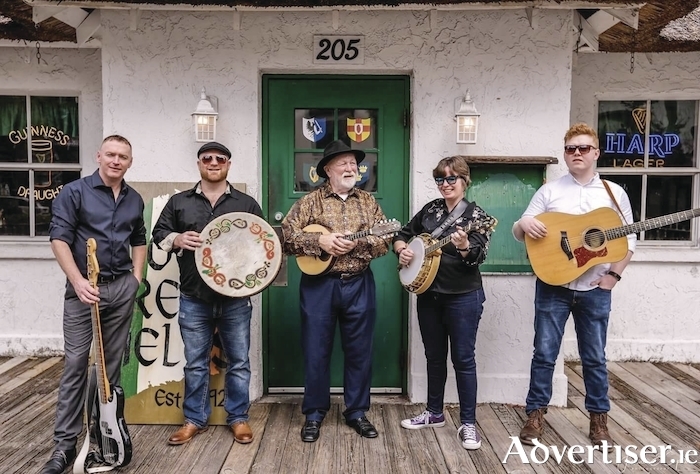 He has teamed up with The Young Wolfe Tones - Damaris Woods, Garry Gormley, Ciarán Cooney and Cormac McGuinness - and they bring together some of the finest musicians and singers in traditional and folk music in Ireland. The gig in Gielty’s in Achill is hosted by the Achill Island Celtic Supporters Club. Tickets for Derek Warfield and The Young Wolfe Tones are currently on sale in Gielty’s in Achill and Achill Sound Post Office. You can also purchase them by contacting David on (087 ) 9177602, Anton on (087 ) 9684154; email [email protected] or message their Facebook page. Tickets are €15 each and strictly for over 18s.